Ships from and sold by BuyOnlineNow Canada. Price: CDN$ 24.63 FREE SHIPPING. Premium quality photo paper provides excellent photo results. The glossy finish allows for vibrant colours and gives you the look and feel of a traditional photograph. 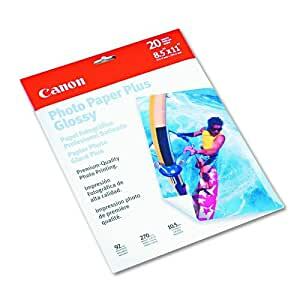 Canon's Photo Paper Plus is a premium-quality paper, ideal for photo enlargements, albums, sharing, and fun projects--the perfect companion for your Canon digital camera and Canon bubble jet printer. The slick glossy finish makes your photos look and feel like they came from a professional lab, without the high cost or wasted waiting time. The package contains 20 sheets of 8.5-by-11-inch paper. Each sheet boast 92 brightness, 270 g/m2 density, and 10.5 mil thickness, resulting in a highly reflective surface with a sturdy feel. Tired of paying the higher prices associated with Canon brand photo paper (versus any other brand of photo paper), I decided to do a little quality comparison right at home. I bought some less expensive Microsoft photo paper that was also termed "high gloss" photo paper (by the way, you'll disover that there is clearly no industry standard of "high gloss" - it seems anything can be branded as high gloss no matter what the quality). I decided to try to print out a low-resolution photo on each type of photo paper and compare them both. For starters, my Canon printer would not even let me choose the option of low resolution when I selected any other type of photo paper aside from Canon. So I had to settle for printing a medium-resolution photo on the Microsoft paper and comparing it to the low-resolution photo printed on the Canon high gloss. AMAZING what a difference there was - the Canon paper beat out the Microsoft paper by far, even with low resolution. Furthermore, even when I swtiched to high resolution for the Microsoft paper, there was no comparison to the low resolution Canon paper. Canon really knows how to make the best photo paper - pay the price, it's well worth it. I have the Canon MP500 printer and Canon Rebel XT camera - both capable of producing amazing results, but paper makes a HUUUUGE diference in photo printing. I have both the Canon Photo Plus Glossy and the Photo Pro papers. If you are looking to print out very impressive photos, then I would recommend getting the 8x10 Photo Plus Glossy - definitely nice enough to frame. And with Plus glossy, you're definitely saving $ instead of paying $$$ to have professional photos done at a professional or retail store. And I even scanned a professional photo that I had done last year with my MP500 and printed using Plus Glossy, and the print is significantly better than the original. Pros: Best Value Canon has to offer. Great, great prints, my favorite paper overall. As good as Pro, and less expensive. About 55 cents per page in a 30 page pack of Pro compared to 40 cents per page in a 20 page pack of Plus. Cons: None at all so far. have not seen if photos last over time. I print with a Canon 9000 and if you want the best printouts at a reasonable price per page, this is it. One of the things I like about this paper is how white it is and how little ink is required to produce vibrant colors. Now I often print with the higher end papers like Photo Rag and Premium Matte and those are great and all, but in reality they are only about 10% better results than this paper, cost 2.5 times as much per square inch and most importantly they DRINK ink. Total cost of ownership and the resulting pics you get put this paper at the top of the Canon list for my most frequent pic printing needs. Package came in, looks old stock, hence 4stars instead of 5. Paper works fine.